On your mark! Get Set! Go! 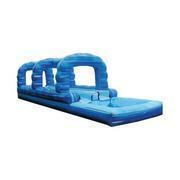 Take your running start and jump into these awesome slip & slide rentals. Race your friends to end or just enjoy the splash, either way you'll have a great activitiy for a hot summer day. Simple setup and they fit almost any location. We have a variety of themes and colors, so pick one that works with your event theme. Browse the selections below and click on the title or image for more information and to make a reservation.